This discussion will focus on capturing dust particulates and does not cover gasses and chemical compounds released during finishing operations or when cutting chemically treated or composite materials containing various chemical compounds. You are responsible for your safety and should ensure that you know and understand the risks involved regarding particulates and gasses generated during shop operations. Follow all manufacturer's guidelines for the products you use. It should be noted that if you don't use an air quality meter to know if your shop air is contaminated, wearing a properly fitted dust mask of some type of powered respirator is the best way ensure that you are not over-exposed to particulates and volatile organic compounds (VOC's). Particulates are filtered through commonly available dust masks. VOC's can only be filtered through special filters which typically are filled with activated carbon to capture the vapors. You should always ensure that the filters you are using are rated for the particulates and VOC's being generated. The following information is focused on particulates generated during typical shop operations and not VOC's. I've measured the particulate filtration efficiency of multiple types of dust masks using a laser particle counter. A good quality N, P or R, 99 or 100 mask will meet their noted ratings and provide great particle filtration if they are properly fitted and if your face is shaved and smooth. You can find more information regarding mask and filter notations and ratings HERE. The numbers are tricky because filters are rated by the percentage of particles they filter out when what we really care about is the percentage of particles that they allow to pass. Here's a quick overview of the numbers... a N99 mask will pass 1% (filters 99%) of the particles that are 0.3 microns and larger. A N100 mask will only pass 0.03% (filters 99.97%) of the particles 0.3 microns and larger. So even though 99% and 99.97% seem close to the same, a N99 mask will pass 33x (=1.0%/0.03%) as many particles as a N99 mask and a N95 mask will pass over 166x (=5.0%/0.03%) as many particles as a N100 mask. If a mask does not fit your face perfectly or if your face is not clean shaven and smooth you can expect the mask to be less than 70% efficient. If your mask isn't properly fitted or if you have a beard or whiskers then using a mask is better than nothing but you are breathing up to 1000x more particles than you would otherwise. If you are cutting pine or some other low risk material then you probably aren't taking a large risk. However, many exotic woods and even some domestic woods are known to cause allergic reactions and nasal cancer. Over a long period of time the risks of many diseases are increased with exposure to particulates. There are many types of dust collection methods. The two most common types cyclones and filters. NOTE: NEVER use a cyclone without a filter downstream. Cyclones do NOT remove the smallest and most dangerous particles from the air stream. See "All About Cyclone Separators"
1. Cyclones - Cyclones are used to separate large particles from the flow. They are not effective at removing particles under 2.5 microns which are considered the most dangerous from a health perspective. They do remove up to 99% of particles over 50 microns which makes them very useful to prevent filter from clogging as quickly. 2. Filters - Filters are the primary method used for final stage filtration in small dust collection systems (under 5hp). Quality filters can be very effective at removing particles down to 0.3 microns or even smaller. Filters may be implemented as bags or cartridges with pleated filtration media to provide a large filter surface area for a relatively small volume of space occupied. Bags are used almost exclusively when a cyclone separator is not incorporated into the dust collector design. The dust flows through the blower and into a vertical column where the heavy dust falls into a cloth or plastic bag on the bottom and the air and fine dust flow up to a bag filter at the top. Many bag filters are not effective at removing particles under 1 micron so be sure you check the specifications. 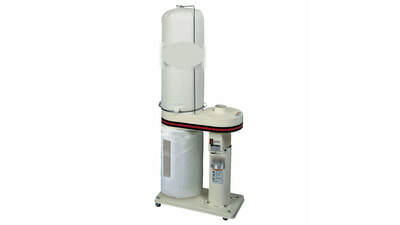 For instance, a quick search shows that one major manufacturer offers dust collectors with bags only rated for 50 microns. This will catch the visible dust but it essentially acts as a "dust pump", passing all of the most harmful particles through the filter and recirculating them through the shop. From a safety perspective the air would be safer without using any dust collection compared to a system that passes particles 50 microns and under. For those of you who have very curious minds... 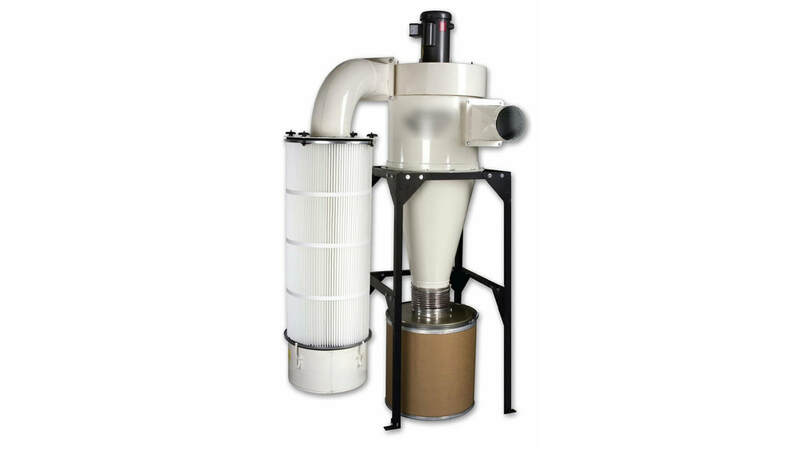 There are several other types of dust collection used, typically in industrial settings. Search for the following terms to find out more. Catch the heavy dust in a bag and vent the exhaust air outside. 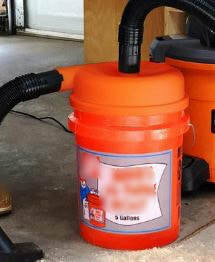 Catch the heavy dust in a bag or bin and pass the exhaust air through a filter back into the work space. There are advantages and disadvantages to each method. In the following paragraphs will discuss pros and cons as well as various options to improve whatever system you use. Many shops vent their shop dust directly outside or they may pass it through a cyclone or some other type of collector to catch the heavy dust particles and vent the small particles outside that the cyclone cannot capture. Less energy use for shops with unconditioned air: It uses less energy than filtering the air since no filters are involved to restrict air flow. Less maintenance: There are no filters to clean with this setup so the only maintenance required is to empty the dust bins when they get full. Less chance of shop air contamination: Since none of the air is being recirculated back into the shop (assuming the shop has adequate return air flow to prevent backwards air flow through heater exhaust pipes), the system continuously pulls in outside air to replace the air exhausted by the dust collector. As long as the dust is exhausted properly the dust collector will continuously pull in "clean" outside air. More energy use for shops with conditioned air: If your shop is heated or air conditioned then anytime you run an externally vented dust collection system you draw in as much outside air through cracks in the building as you exhaust. I.E. if you vent a 3000 CFM dust collector outside then you are drawing in 3000 CFM of outside air which your furnace or AC will have to condition for temperature and humidity changes. In most cases, the cost of reconditioning the air will exceed the cost of maintaining and replacing air filters for a system that vents inside the building. Indoor air quality can never exceed the outside air quality. In many areas the outdoor air quality is not good. If you live in such an area then your shop air quality reflect the outside air quality. Many shops use dust collection units that recirculate filtered air inside the shop. The dust is collected from the tool then fed through a cyclone or some other type of separator then through a filter material. Less energy for shops with conditioned air: Not exhausting conditioned air to the outside and therefore not drawing in unconditioned air from the outside means lower energy bills. The cost in materials and labor to replace and maintain filters is typically more than offset by the energy savings. The cost savings increases with the difference between inside and outside temperature and humidity and with the flow rate of the dust collection system. Indoor air quality can exceed outside air quality. In many areas the outdoor air quality is poor. A filter rated to capture particles down to 1 micron or better will act as air filtration system for your entire shop anytime hour dust collector is running. I suggest doing your research regarding filters and always use a filter material rated to capture particles down to 1 micron in size. Pleated cartridge filters and bag filters are available for dust collectors and shop vacs. For dust collectors, pleated cartridge filters offer more surface area than bags and therefore typically have less pressure drop than a bag filter of the same size. For shop vacuums the bag filters are the full size of the shop vac collection bin and therefore cause very little pressure drop until they get more than half full. More maintenance: Most newer systems use cyclones to separate all of the larger dust particles before they get to the filter, which greatly extends the time required between cleanings. However, even when cyclone separators are used, filters get caked with dust and drop the flow rate and therefore must be cleaned periodically. The intervals between cleanings and replacements will depend on how efficient your cyclone or other pre-separation device is as well as how much and what kind of dust you collect. In general, cyclones capture over 95% of the dust that enters. However, they capture less than 10% of the most harmful dust particles which makes quality filtration a must for healthy air. More risk of shop air contamination: All of the exhaust portion of a dust collector is pressurized above atmospheric pressure. The filters in internally vented systems drive this pressure higher than is seen in externally vented systems. This means that if the exhaust portion of your dust collector has a leak it will spew dust contaminants into your shop. I always operate a particulate counter in the shop to ensure that I'm aware of air contamination if it occurs. I stopped using a dust collector years ago. Now I use a small cyclone separator connected to a shop vac with a bag filter AND a cartridge filter that runs to all of my tools. This setup captures over 99.9% of the dust collected and is more than adequate for most types of dust. Note: if you are collecting dust that is a considered hazardous waste then you should use a certified HEPA vacuum. For the vast majority of situations, a cyclone and a quality two stage filter setup (bag and filter) will be more than adequate to provide healthy dust filtration. Even when cutting MDF with my CNC router, I don't see any detectable rise in shop air particle concentrations for particles 0.5 microns and larger. The cyclone captures close to 99% of the dust so I can run my CNC for several hundred hours without ever having to change the shop vac bag or clean the filter. I also use a custom designed shop air filtration system to remove any particles that aren't collected at the source. My shop air typically has less than 10% as many particles as the outside air. Yes, you read that right... you can vent your dust collection system inside and still turn your shop air into the cleanest air around for relatively little cost. ​By far, the most efficient method to maintaining healthy shop air is to collect the dust as close as possible to its source. It takes a hundred times more energy to filter the dust filling your entire shop than it does to remove the dust directly at the source. 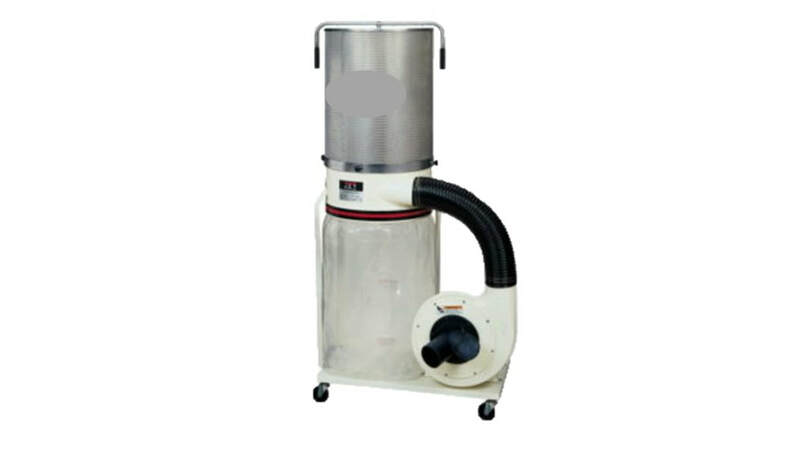 The closer you can bring the vacuum inlet to the cutter surface the more effective the dust collection and the less power that is required to collect it. Consider the experiment illustrated below. Both experiments used the same dust and the same shop vac hose. Before the vacuum was turned on the dust was even with the inlet of the hose. 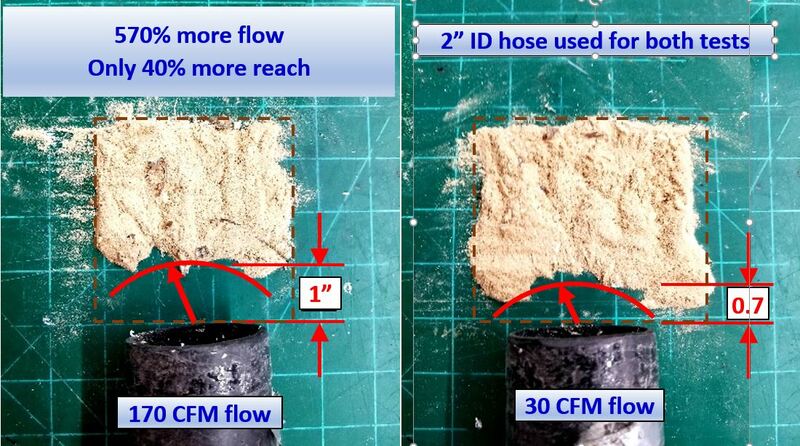 The experiment on the left was conducted using a 170 CFM flow rate through the vac hose. The experiment illustrated on the right was conducted using only 30 CFM. As you can see, using over 500% more flow rate (which means over 500% more power required) only increased the "reach" of the vacuum by about 40%! Rest assured, even if we would have increased the flow rate by 10x we still would not have even doubled "reach" ...the distance away from the hose that it can capture dust. In this experiment the dust was just laying static on the green mat. If the dust was moving past the vacuum inlet the reach would have been even less. If you extrapolate these results it becomes clear that using brute force by adding a huge dust collector to your shop may help but its is not nearly as smart or effective as modifying your tools to collect dust closer to the source. Spend a little time modifying your tools to collect dust closer to the source and you may just be able to do just a better job collecting dust with a few $100 shop vacs fitted with cyclones and quality filters as you can with a $3,000 dust collector. Figure 1: It takes almost 6x more flow and power to reach only 40% further. Be smart and modify your dust collection at the tool instead of buying expensive dust collectors. Most tools are not designed to provide effective dust collection so you must modify them or use very high flow rates to capture the dust before it escapes into your shop air. Some of the newer designs include fully enclosed cutters that force all of the dust created into a port that leads to a shop vacuum or a dust collector. For example, a modern table saw that has a fully enclosed dust port will provide more effective dust collection using a 150 CFM shop vac than an older design without an enclosed dust port using a 1200 CFM dust collector. The only difference is that the newer design fully encloses the area where dust is generated so that a relatively small flow of air can capture and transport more dust to a bin. So, how can you incorporate what you've learned here into modifying your tools to achieve better dust collection? Start with duct tape and cardboard! Build simple and crude shapes out of cardboard and duct tape to contain dust near the cutters of your tools. For example, use a dust boot for your CNC router, add a flap on the back side of your miter saw to direct more dust into the dust port, seal all of the openings of your cabinet saw so all of the vac or dust collector air is forced through the blade slot and around the blade. As I release videos and blogs, I'll incorporate that information into this section to make it easier for you to visualize practical solutions that don't cost much but offer huge improvements in dust collection. It is practically impossible to capture ALL of the dust created by your tools at the source. Some amount will escape into the ambient shop air for some operations. Shop air cleaners are an essential to maintain clean and healthy shop air. They greatly reduce the amount of fine dust that settles after your turn out the lights. A shop air cleaner is a great way to get that dust out of the air as fast as possible before you breath it. I've tested several homemade air cleaners and compared them to a Powermatic PM1200 system shown below which retails for around $500. I tested the PM1200 and found that it removed around 60% of the particles 0.5 microns and larger per pass. The product claims a flow rate of 1200 CFM but I measured closer to 1000 CFM with a two month old, relatively clean filter. I measured the air velocity at several points at the outlet using an anemometer and used the average over the area to calculate CFM. The unit draws around 500 Watts on the "high" setting. Keep in mind that the power consumption matters because this is essentially the same as running a 500 Watt heater in your shop anytime the unit is running on "high". The outlet air will always be several degrees warmer than the ambient shop air so it will heat your shop anytime that it is running. There's nothing magic about air filtration systems. This one consists of a squirrel cage blower similar to the ones used in a home HVAC unit, but smaller. It includes a pre-filter which is similar to a cheap furnace filter as well as a second stage filter that captures finer particles. The second stage filter has much more surface area to allow high air flow while simultaneously providing moderate filtration efficiency. This unit includes a remote control and a timer that shuts the unit off in user selectable increments of 1 to 9 hours. This allows you to keep the unit running after you leave the shop to capture any particles remaining in the air after your last cut of the day. 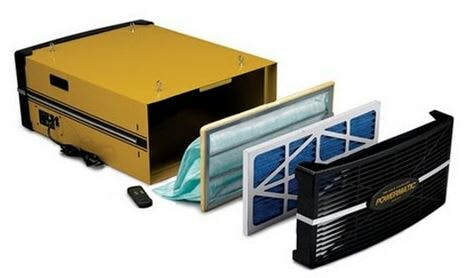 The unit is adequate to maintain clean shop air if you don't release large amounts of dust into the air. For example, at 1200 CFM inside of a 25'x30'x8' enclosed work-space, this unit will recycle all of the air in the shop every 5 or 6 minutes. Theoretically, that means that the particle counts for dust that is 0.5 microns and larger should decrease by about 60% every 5 minutes with this unit running. In reality they will decrease much more than that because much of the dust will settle in that time. I would recommend having enough air filtration units running to recycle all of your shop air in less than 5 minutes. The formula to determine the minimum CFM required for your shop is: Minimum CFM = Shop length x width x height divided by 5 (all units in feet). I tested a DIY air filtration system using two 20x25x1" furnace filters ($20 each) attached in a "V" configuration to the inlet of a 20" box fan ($20) similar to the configuration in the photo below. I saw a 60% drop in particle counts between the inlet to the outlet with very close to 1200 CFM and only drawing around 150 Watts on "high". I didn't take a picture of the system I built and I use a different system now but the picture below from tombuildsstuff.blogspot.com is the exact same system that I tested except the filters may have been slightly different. This $60 system performs about the same as the $500 Powermatic in terms if filtration efficiency. The Powermatic unit may be able to maintain efficiency for more or less time than this setup. I did not test for filter load capacity for either system. I put the filters before the fan to keep dust out of the motor. However, the flow rate will be about the same either way. Using multiple filters is definitely the best approach. The pressure drop across a filter decreases 4x when you increase the area 2x. So, the pressure drop across 2 filters at a given flow rate will be 1/4th as much as the pressure drop across one filter at the same flow rate. Axial fans such as are used for house fans move a lot of air if there is no resistance (low pressure drop) but the flow drops off VERY quickly if you introduce much resistance. The free flow of a 20" box fan is over 2000 CFM. Adding two high grade filters will drop the flow to around 1000 CFM. Also, using multiple stages of filters will maintain a higher flow rate for a longer period of time between filter cleaning/replacement. Use a cheap course filter or just a piece of cloth for the first stage, a medium grade for the second stage and a high grade filter for the final stage with a small gap between each stage. That combination will last much longer than a single stage and requires less frequent filter replacement. Ceiling mounted air cleaners typically don't take up any previously used space in the shop so they are a good option. 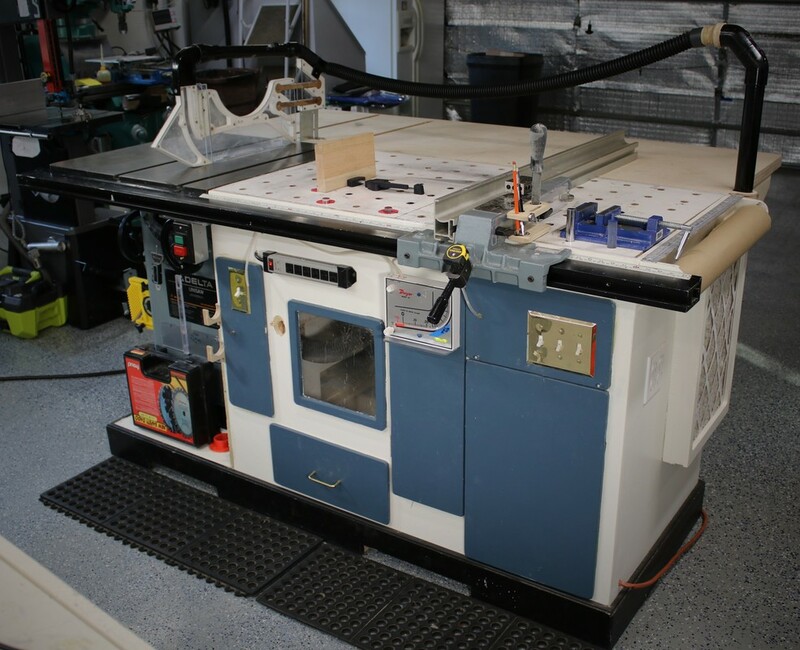 I built the downdraft table shown in the photo below. I use it as a table saw dust collector as well as a shop air cleaner with high efficiency filters. This system provides shop air cleaning and doesn't take up any extra space.